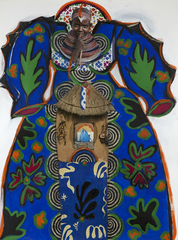 Matisse Blue Dress, 2013 Acrylic With Collage Of Various Papers, Pastel, And Digital Photographs On Arches Paper. © Courtesy of Imlay Gallery and the artist. Wednesday – Sunday, Noon – 5 p.m. The Montclair Art Museum (MAM), a notable, community-based institution with an international reputation, boasts a renowned collection of American and Native American art that uniquely highlights art making in the United States over the last three hundred years. The collection includes more than 12,000 objects: paintings, prints, original works on paper, photographs, and sculpture by American artists from the 18thcentury to the present, as well as traditional and contemporary Native American art and artifacts representing the cultural developments of peoples from all of the major American Indian regions. The Museum’s education programs serve a wide public and bring artists, performers, and scholars to the Museum on a regular basis. MAM’s Yard School of Art is the leading regional art school, offering a multitude of comprehensive courses for children, teens, adults, seniors, and professional artists. The Museum was a pioneer: one of the country’s first museums primarily engaged in collecting American art (including the work of contemporary, nonacademic artists) and among the first dedicated to the study and creation of a significant Native American art collection. This pioneering spirit still reverberates in the Museum’s pursuit and presentation of high-quality art that characterizes and celebrates America’s diversity, including the recent launch of its Contemporary Art Program, in 2010, providing MAM an opportunity to showcase dynamic contemporary work and expand the Museum's contemporary art holdings. A main feature of the MAM program is to explore the interplay between historical and contemporary art to enrich our understanding of the larger historical context in which art is created, presenting work that is both challenging and accessible. A key component of the Contemporary Art Program is its New Directions exhibition series of solo artists, established in 2011. Artists featured in the series include Marina Zurkow, Saya Woolfalk, Spencer Finch, and Sanford Biggers. Most recently, in spring 2015, MAM presented its largest and most ambitious exhibition of contemporary art to date, Come as You Are: Art of the 1990s.Information and directions are available on the Museum website, montclairartmuseum.org, or by calling 973-746-5555.